This tiny, online space is not forgotten. I simply took some much-needed time for me. But I’ve missed this terribly. This place. Writing. It’s not to be overlooked or undervalued. I haven’t been comfortable sharing my thoughts, opinions and experiences for immediate public consumption. Striking a balance between my online presence and real-world life has been an impossible task over the past year (and it’s not just me). Nonetheless, there has been a fair amount of ice cream and perhaps a cocktail or two. Some fantastic travels to the south of France with dear friends and scuba diving in Bonaire with family (where you might just find yourself swimming with a pod of dolphins) and many other places near and far. A re-upholstered chair and a revamped sofa table turned kitchen cart. But more than anything else – life as an academic and biologist. This past year has been a doozy and change is underway. (The details on that are for another time). But on to more pressing topics … It’s springtime in Minneapolis! At last! Opening the windows, biking into campus, beers on patios and the start of farmers markets. – a glorious time indeed. I’ve been in a flurry of spring cleaning – my closets, my kitchen, the laboratory. No space I occupy has been safe from my critical eyes. I adore the process of shedding winter layers. To rediscover lost treasures and carefully assess what to keep close and what to finally let go of. It’s no small task and not an easy one either. But the psychological satisfaction of this particular accomplishment is one of the best there is. It’s not for everybody, but it certainly is for me. Now that the dust has been cleared and I’ve got no upcoming travel scheduled, I’ve been having fun playing in my kitchen. To brush up on my skills and hone my culinary instincts. To anticipate the summer bounty and enjoy fresh, seasonal food again. 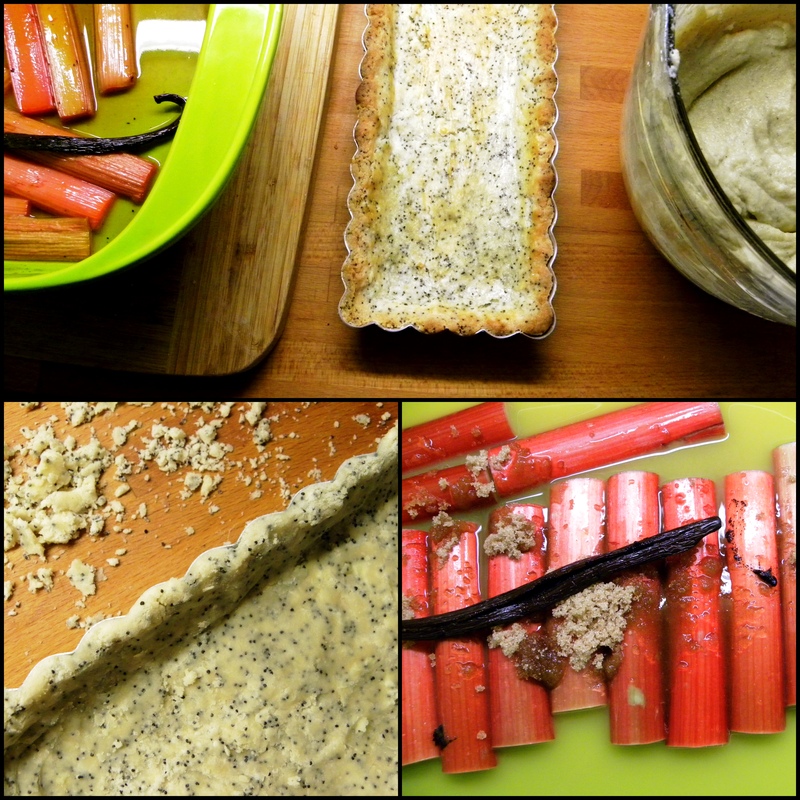 Which brings me to … RHUBARB!!! I’ve waxed poetic time and time and time again about my favorite spring crop, so let me just cut to the chase. 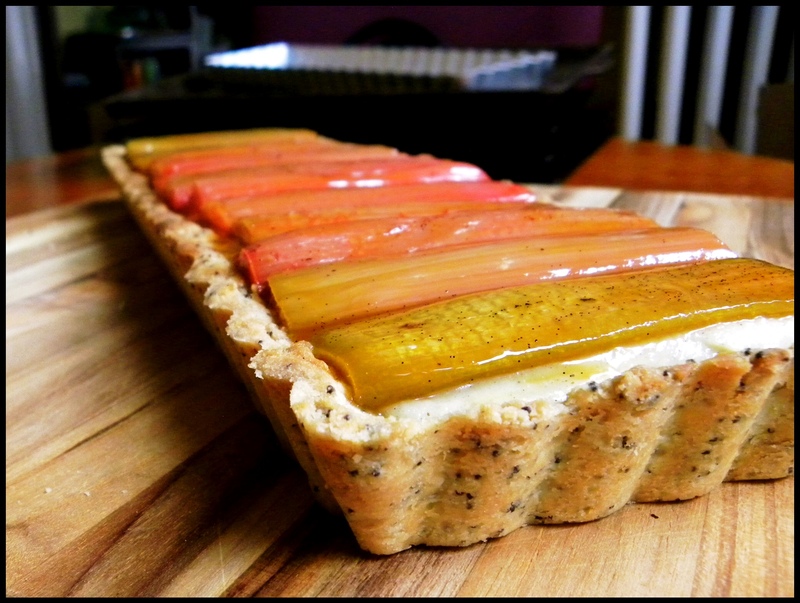 An afternoon tart of roasted rhubarb with cardamom pastry cream and orange poppyseed shortbread crust. This dish took me the better part of a Saturday morning, but there is no reason why the parts can’t be made independently and assembled whenever it pleases you. It’s good. Very good. In my opinion, worth not only the time, but also the number of dirty dishes. Combine all ingredients in an oven safe dish. Roast at 300 degrees for about 50 minutes, occasionally so that the rhubarb is soft, but still holds its shape and the juice is reduced to about a quarter cup or so. Make the filling: Whisk together sugar, cornstarch, cardamom, and salt in a 2-qt. saucepan; whisk in milk and eggs. Bring to a boil over medium heat; cook, whisking constantly, until thickened, about 1 minute. Remove from heat; whisk in butter. Transfer mixture to a bowl (pressing through a sieve, if you are so inclined, as I usually am); press a piece of plastic wrap onto surface of filling. Refrigerate until ready to use. Cream the butter, mix in the sugar, lemon zest, poppy seeds and salt followed by the flour and mix until it forms crumbs. Press the mixture into a 4” x 13.5” rectangular tart pan. Freeze for 10-15 minutes and bake in a preheated 400F oven until lightly golden brown, about 15 minutes before letting it cool. Spread chilled cardamom pastry cream into baked shortbread crust. Carefully top with roasted rhubarb pieces. Brush with the reduced vanilla orange juice. Serve cold or at room temperature. I had a birthday earlier this month. To be honest, this may be the first year when I haven’t given much thought about it, no major self-reflections on where I am in my life, about the past year or what I want to tackle in the future. No convincing myself that age is just a number and you are only as old as you feel. Perhaps because I had been crazy with work or because I knew I was going to spend the day with my family. Or more likely, because I didn’t really want to think about it. Thinking about cake, however, was something I could gladly spend my time on. 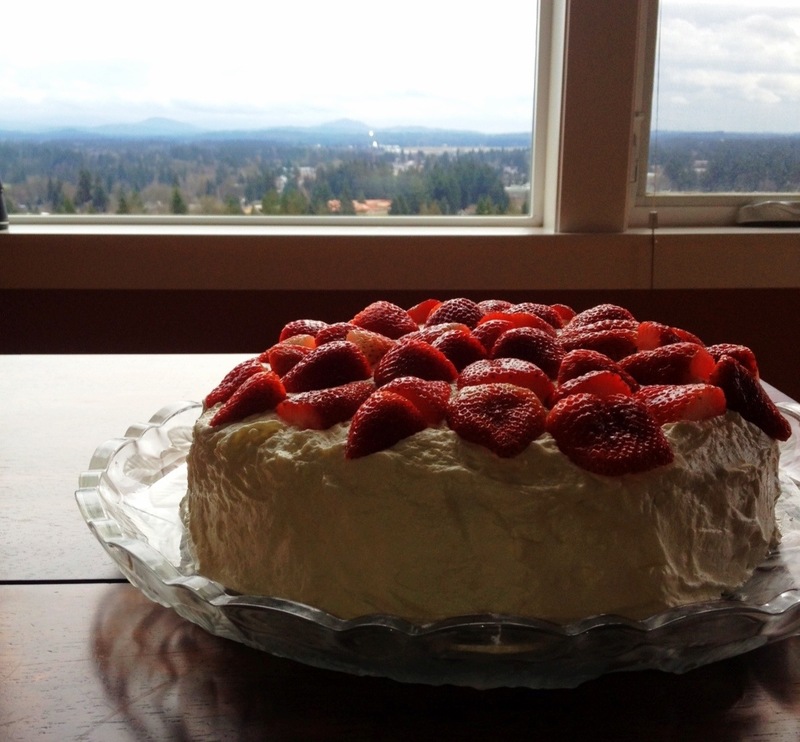 By the start of March, my yearning for spring is all-consuming, so I tend towards fruit-filled cakes (see last year and the year before). This year was no exception, and as I had the pleasure of spending the weekend with my family in Washington, which includes a four-year old niece and a year and a half year old nephew, I steered away from my inclinations towards coffee and alcohol in my dessert. 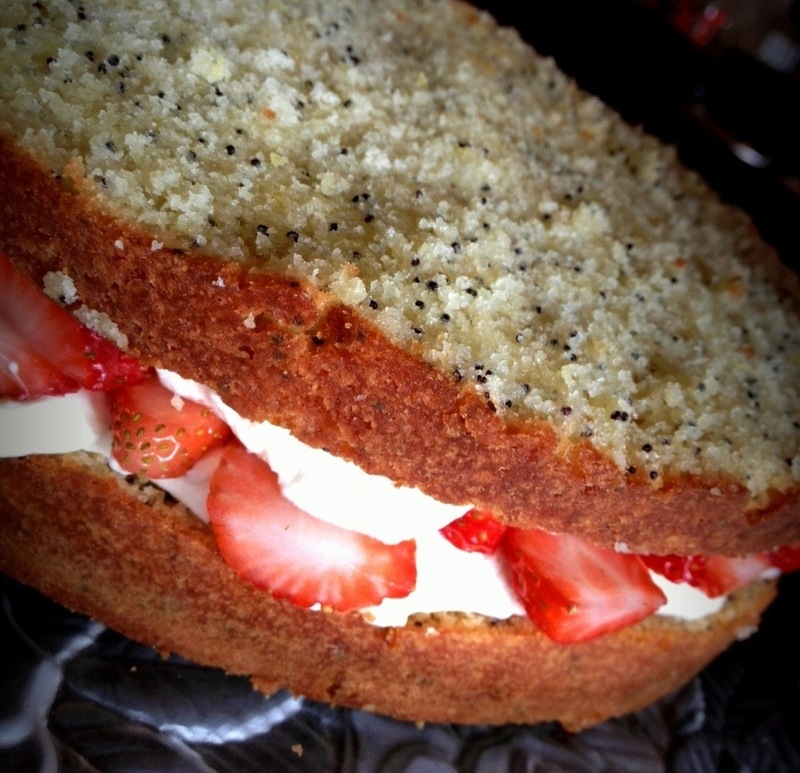 I’ve had this recipe for Poppy Seed Layer Cake with White Chocolate Cream and Strawberries saved for many years, but never a good opportunity (or crowd) to serve it. This is not your typical birthday cake (i.e. cloyingly sweet and overly dry), instead, its bright with lemon infused throughout and dotted with poppy seeds. The white chocolate cream? 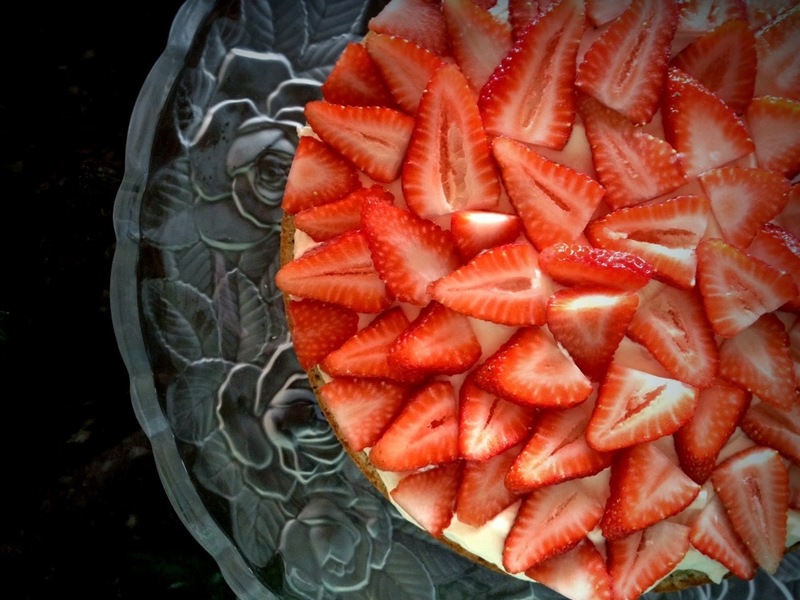 Out of this world and a perfect complement for the strawberries. 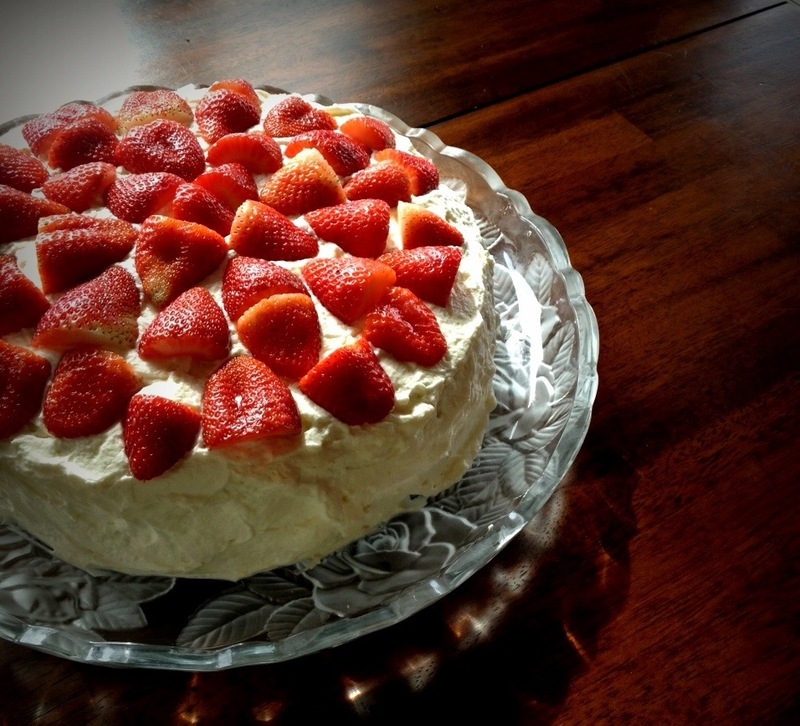 It makes a large cake – so invite your favorite people to share it with. My cousin, notoriously picky (especially for non-chocolate desserts) even went back for a second piece. I may have had a second piece also … it was my birthday after all, and if nothing else, I make damn good dessert. Preheat oven to 350°F. Butter 10-inch-diameter springform pan with 2 3/4-inch-high sides. Line bottom of pan with waxed paper; butter and flour paper and sides of pan. Combine flour, baking powder, baking soda and salt in medium bowl. Cut in 6 tablespoons butter and set aside. Beat sugar, remaining butter and lemon zest in large bowl until smooth. Add eggs one at a time, beating well after each addition. Beat in lemon juice and vanilla. 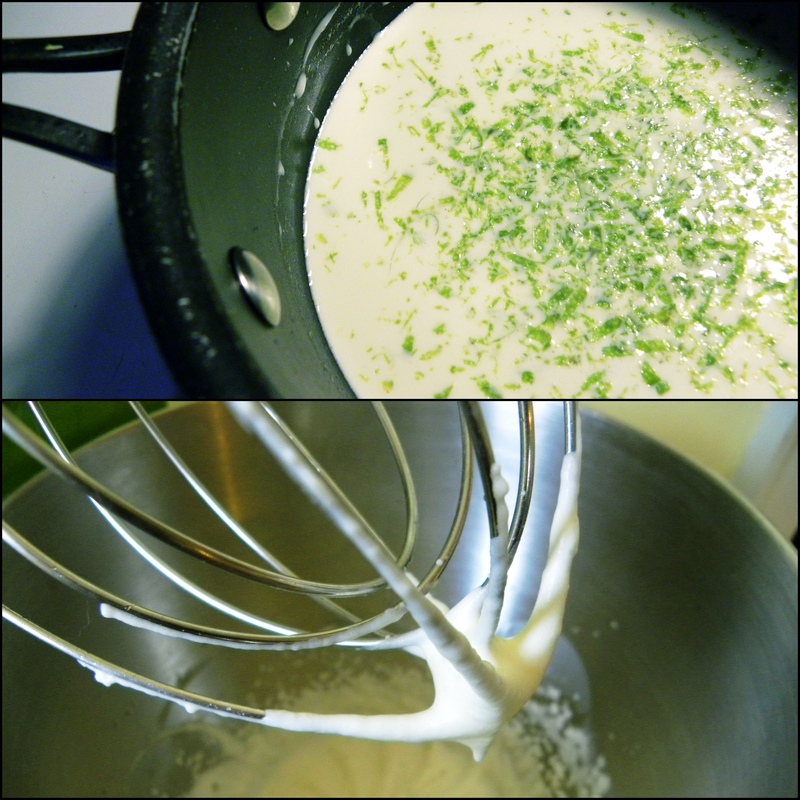 Add dry ingredients alternately with buttermilk in 3 additions each, beating just until blended. Stir in poppy seeds. Transfer batter to prepared pan. Bake until cake is golden and tester comes out clean, about 45 minutes. Transfer pan to rack. Run knife around pan sides to loosen cake. Release pan sides; cool cake. Combine 1/2 cup sugar, eggs and lemon juice in top of double broiler set over gently boiling water. Whisk until very thick and candy thermometer registers 160°F, about 3 minutes. Remove from water. Add chopped white chocolate and whisk until smooth. Cool to room temperature. Beat heavy cream and remaining 1/4 cup sugar in large bowl to firm peaks. Fold in white chocolate mixture. Turn cake out onto work surface. Peel off paper. Cut cake horizontally into two equal layers. Transfer one cake layer to platter, cut side up. 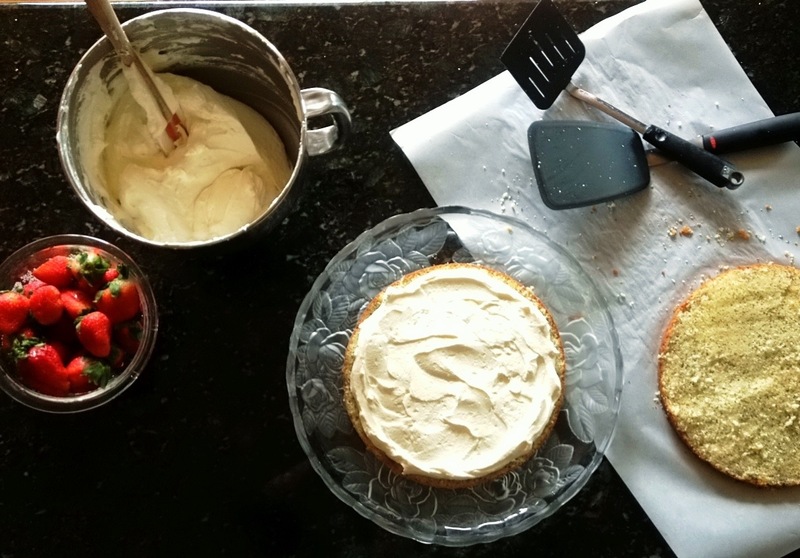 Spread 1 1/2 cups white chocolate cream over the cake layer. Arrange sliced strawberries in single layer over chocolate cream. Spread more white chocolate cream over the strawberries. Top with second cake layer, cut side down. Spread 3 cups chocolate cream over top and sides of cake. Garnish cake with strawberries cut in half. My friends are part of my family. They mean the world to me and I have endless love for them. So when they are hurting and heartbroken because life can be cruel sometimes, I take it personally. I want to sit on the couch and hold their hand and just be with them, so they don’t have to be in that scary and dark place alone. Except for those pesky hundreds of miles that separate us. I have a friend suffering a devastating loss and it upsets me. Because of the pain that I cannot take away and because there is so little I can do, amplified because I am not there during this difficult time. I have ceased to be amazed at how adult my life as become, which I suppose is a perfect example of my adultness. The problems that you fret over – they are the big ones, the ones with no good solutions and they weigh heavily upon me. So I bake. It is my therapy. Or perhaps, more realistically, my escape. To have a goal, a blueprint that you can see through to the end. Having complete control. Knowing the variables. My mother thinks that I am some frou-frou cook, making everything from scratch, taking the hard (and time-consuming) way to do things. I think she may have a point. Sure, I could make something easier, with fewer steps or more store-bought ingredients, but that’s not me. I like that I can choose the hard route. I like the process, the transformation of whole foods into something else. Cracking the eggs, straining the puree, using any and all of my extensive collection of measuring spoons. Lugging my gorgeous green stand mixer from the dining room to the kitchen counter. Dirtying every pot, mixing bowl and mesh strainer. Pouring a glass bourbon, and then a another one to help dull the edge of life. Because some nights you just need to bake until 1:30 in the morning. Even if it is a Tuesday night. I’ve had my eye on this recipe for these Pomegranate Clove Thumbprint Cookies every since I got my hands on Ripe by Cheryl Sternman Rule over the past summer. Then I spied a quirky Cranberry Curd recipe in a recent issue of Cooking Light and my gut told me they had to go together. My gut doesn’t usually steer me wrong and this is no exception. Don’t forget the pomegranate arils – they make the cookies unexpected and delightful. And the color? It simply speaks for itself. If you are lucky enough to have your friends nearby, invite them over and share an afternoon, some hugs and these cookies. Be warned however – they don’t travel well (I suspect gushy nature of the curd is at fault), which is why dear friend, I didn’t send them your way. Please forgive me. The recipe for the cranberry curd makes about 3 cups of curd – way, way more than you need for these cookies. Seal it up in a jar and enjoy the seasonal treat on crackers, biscuits or buttermilk pancakes. It has a nice mouth-puckering quality to it, as all curds (and anything cranberries) should. This curd is slightly different than the curds I’ve made in the past (lemon curd I and II, rhubarb curd, blackberry curd – it’s possible I have an obsession…) as it calls for the butter and sugar to be beaten together before incorporating the eggs or adding any heat. I was a little apprehensive about the technique, but was satisfied with the result. Combine water, lemon juice and cranberries in a medium saucepan; bring to a boil. Reduce heat; simmer 5 minutes or until cranberries pop. Using an immersion blender, process until smooth (can also use a blender or food processor). Strain cranberry mixture through a fine meshed sieve over a bowl; discard solids. Combine sugars and butter in a bowl; beat with a mixer at medium speed until well combined. Add egg yolks and egg, 1 at a time, beating well after each addition. Stir in cranberry mixture, cornstarch, and salt. Place mixture in the top of a double boiler. Cook over simmering water until a thermometer registers 160° and mixture thickens (about 10 minutes), stirring frequently. Remove from heat; let stand 5 minutes. Stir in liqueur. Strain through a fine meshed sieve once more. If using later, cover and refrigerate. In a large bowl, whisk together the flours, baking powder, cloves, cinnamon and salt. Set aside. In another large bowl, beat the butter until light and fluffy, ~2 minutes. Stream in the sugar and beat 2 minutes longer. Beat in the egg and vanilla extract. With the machine OFF, dump in the flour mixture. Turn on the mixer and stir at the lowest speed for 30 seconds and then increase speed to medium and beat just until the flour mixture in completely incorporated. Refrigerate the dough for at least one hour. Preheat the oven to 375º and line two baking sheets with parchment or silicone mats. Scoop ~1 1/2 tablespoons dough and portion into mounds. Using the end of a wooden spoon (or your thumb), form a depression in the middle of the cookie. Bake until the cookies are set and golden brown around the edges, 15 – 18 minutes. Cool completely. 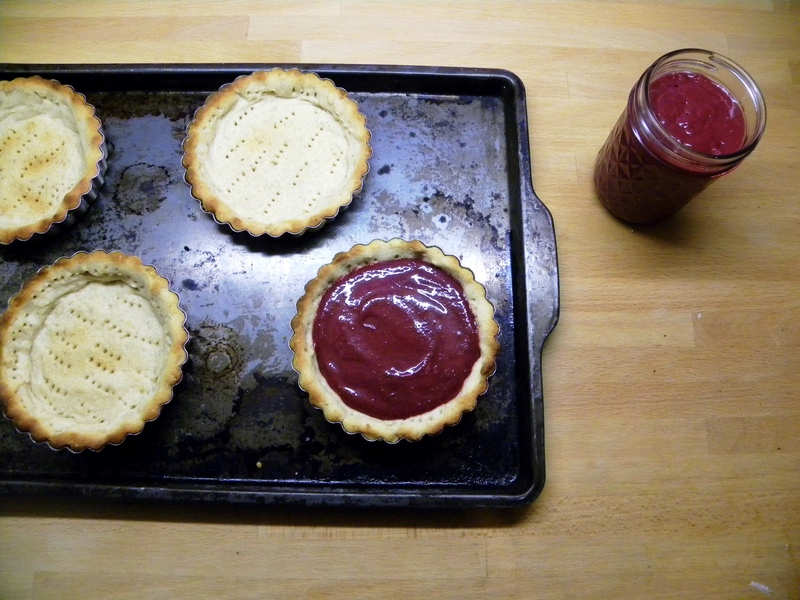 Fill each thumbprint with cranberry curd (the recipe suggests 1/4 teaspoon, I sort of just heaped it on…) and top with 4-5 pomegranate arils. I’ve had a series of baking mishaps. I don’t really want to talk about it. Except to say that my labmates have been going without recently. 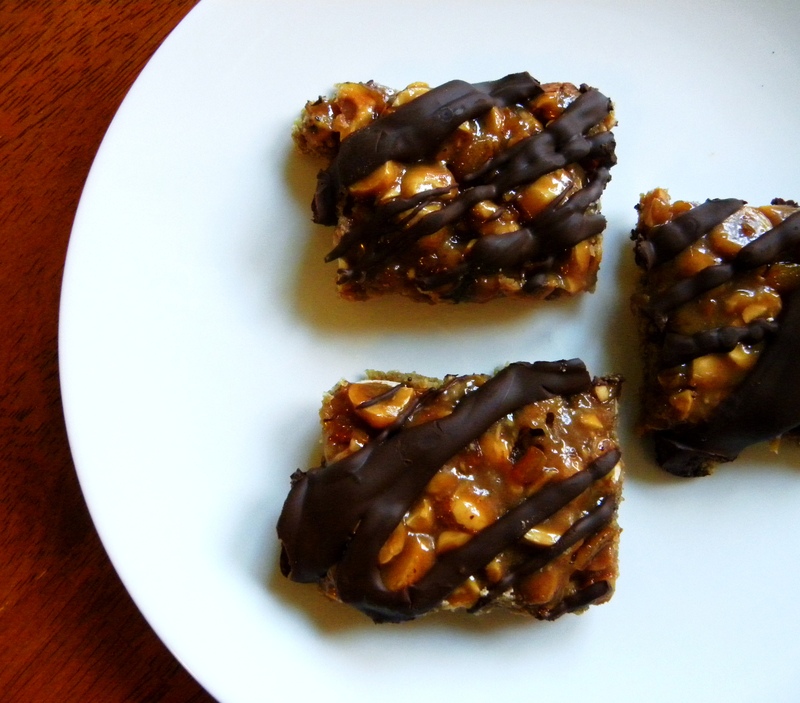 Until I happened upon a recipe for hazelnut caramel bars with candied orange and chocolate. I don’t have an elaborate story to accompany these bars. Sometimes food is food, and baking is fun. They are tasty. The candied orange is unexpected and delightful. In one of my aforementioned baking mishaps I made candied orange peel for the first time and fell in love. So easy! How had I not made it, or utilized in my baking before? A problem easily remedied with these bars. Preheat oven to 350°. Line 13 x 9 x 2-inch metal baking pan with foil. Mix flour, brown sugar, and salt in processor 5 seconds. Add 3/4 cup butter; using on/off turns, process until coarse meal forms. Transfer to pan; press firmly and evenly onto bottom of pan. Bake crust until golden, about 20 minutes. Maintain oven temperature. Bring 6 tablespoons butter, 2/3 cup sugar, cream, honey, and finely grated orange peel to boil in heavy small saucepan, stirring until sugar dissolves and butter melts. Boil until candy thermometer registers 230°F, about 6 minutes. Stir in nuts and candied orange peel. Spoon hot nut mixture evenly over crust in pan. Return to oven and bake until entire surface is bubbling, about 10 minutes. Cool 20 minutes. Using foil as aid, lift cookie from pan. Carefully peel foil from edges. Cut warm cookie into 1 1/2-inch squares. Cool cookies completely. Melt chocolate in small metal bowl set over saucepan of simmering water until warm to touch. Remove bowl from over water. 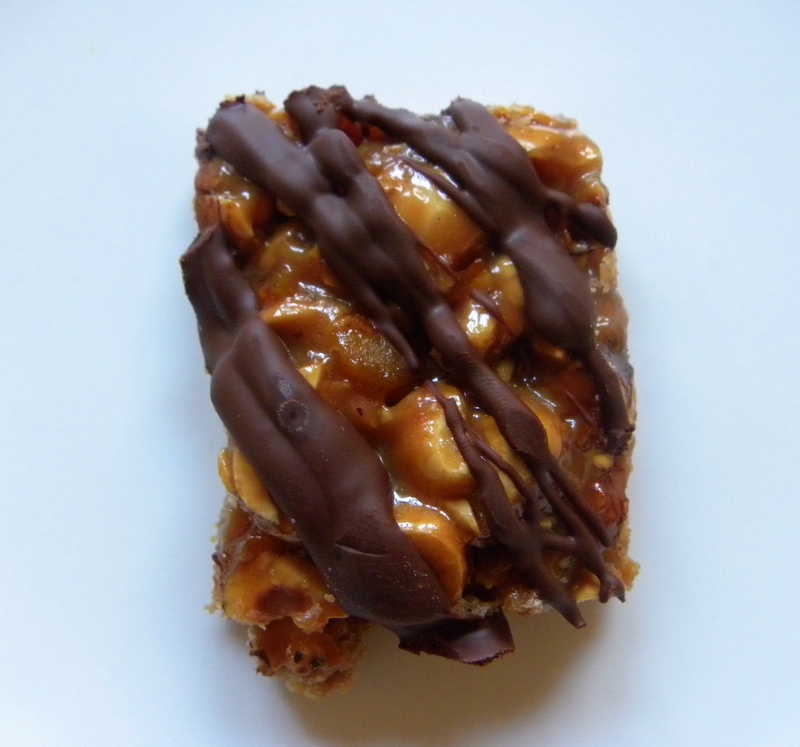 Using a spoon, drizzle melted chocolate over bars. Chill until chocolate is set, about 1 hour. Toss peel and 1 cup sugar on rimmed baking sheet, separating strips. Lift peel from sugar; transfer to sheet of foil. Let stand until coating is dry. Less than a week from now I will be homeward-bound. I cannot imagine a time in my life when I don’t consider the great Pacific Northwest home. It’s been nearly a decade since I resided there, but it will always be where my family is, where my breath catches and heart stops with its sheer beauty. Without fail, when I think of the Pacific Northwest during the summer I think of wild blackberries. Of of early mornings in my childhood traipsing through the logging clearcuts, braving the the thorny vines on the search for the small treasures, eating more than I collected. 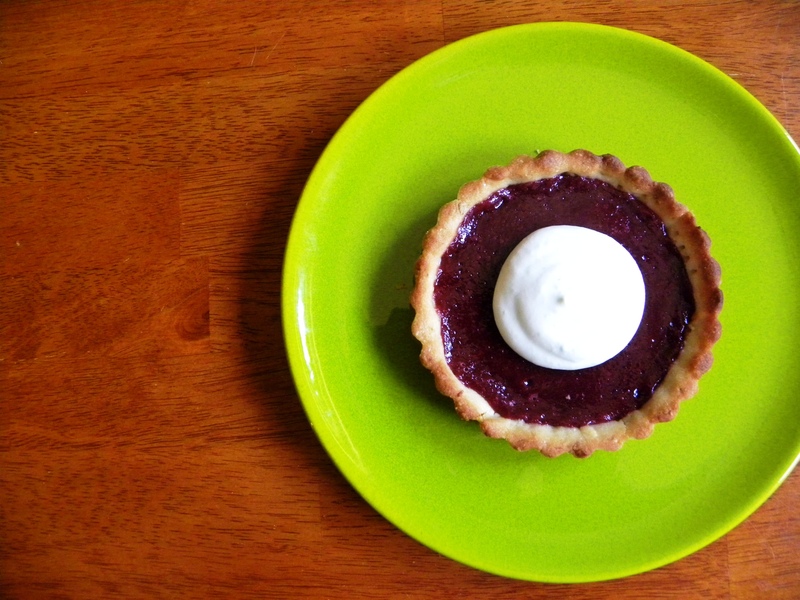 Small, dark as night, and mouth-puckering tart. My platonic ideal of what a blackberry should be. I’ve yet to encounter blackberries elsewhere that even compare. At some point before my summer became insane with work (in a good way), even before I went out to visit home at the start of June, I spent a day playing with blackberries in my kitchen. It’s one of my very favorite things to do, playing in my kitchen. Taking recipes and mashing them together, tweaking them ever so slightly to incorporate the flavor combinations I’ve come to decide must live together. And when the colors just happen to be two of my very favorites in conjunction with a tasty profile – the stars start singing. Blackberry Curd Tartlettes with Lime Hazelnut Shortbread Crust and Honey Lime Whipped Cream. Disclaimer: If all you want is a blackberry pie, please just make a blackberry pie. It will be quicker, easier and way fewer dishes. If you want to spend a day in the kitchen (as I am want to do from time to time), take a stab at these cute little desserts. Or at least make the blackberry curd and eat it on toast, blueberry pancakes (my favorite) or saltines (my mom’s favorite). I’ve also tried making this as a large 11-inch tart, but I prefer the little tartlettes – the ratio of curd to shortbread crust works much better in the smaller version. Combine blackberries, 1/2 cups granulated sugar and 3 tablespoons lime juice in a medium pan and bring to a boil over medium-heat. Reduce heat and bring to a simmer, cook for about 6 minutes or until berries are soft and beginning to fall apart. Transfer to a small bowl (or blender) and blend with an immersion blender until smooth. Strain puree to remove blackberry seeds. Set aside. In a double boiler (but not over heat yet) whisk together sugar, cornstarch and salt. 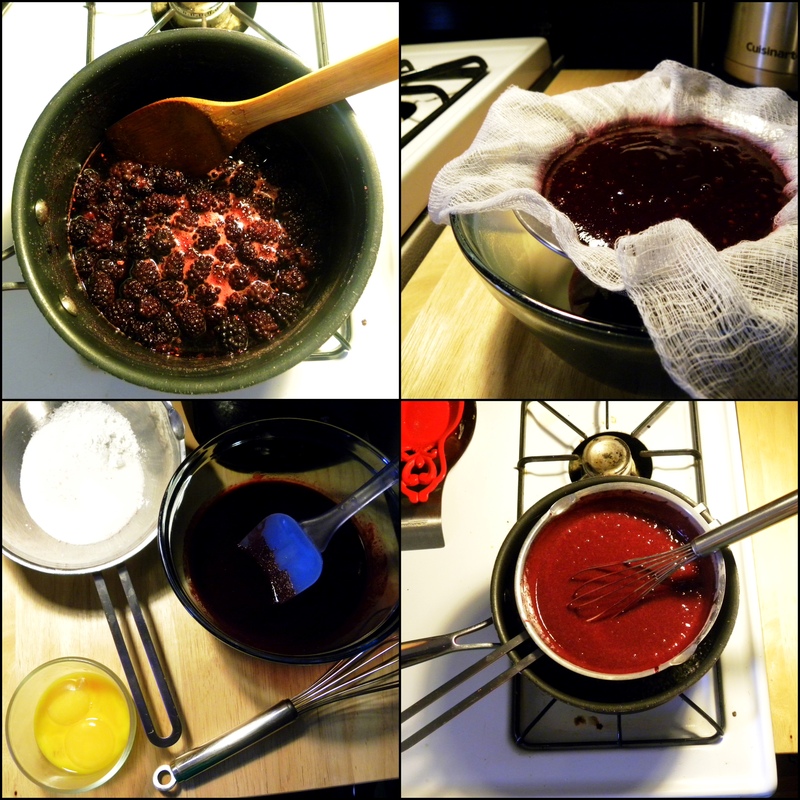 Add egg yolks and blackberry puree and set atop a pot of boiling water. Cook for 10-15 minutes, continually whisking, until color lightens and is thick. Transfer to a blender and allow to cool for 10 minutes. With blender on, blend in 3 tablespoons butter, one tablespoon at a time. Refrigerate in an airtight jar. 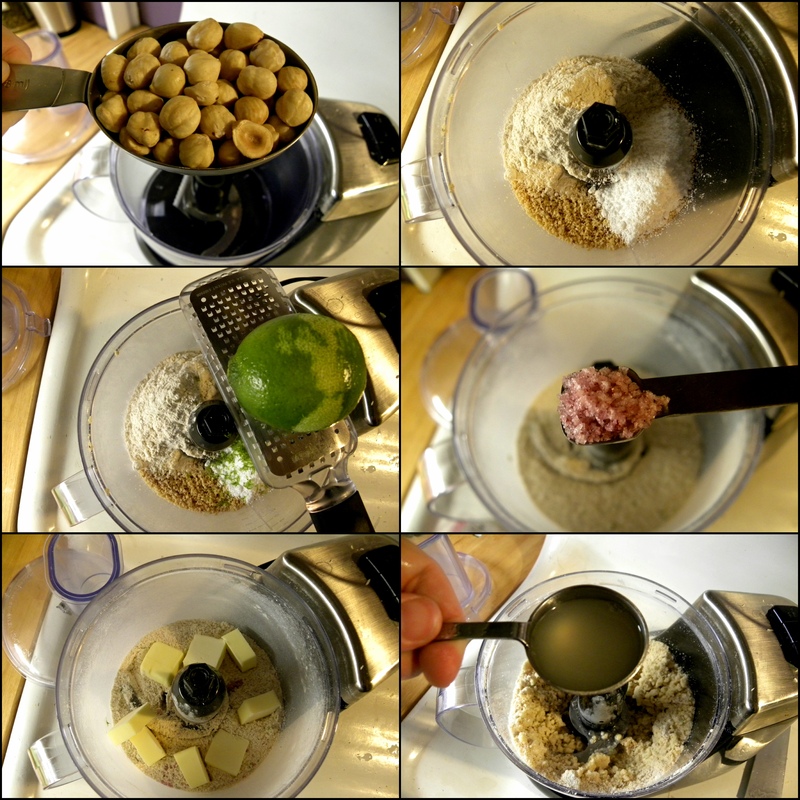 Place hazelnuts in food processor and process until finely ground. Add flour, sugar, salt and lime zest and pulse a couple of times to combine. Add butter and using quick pulses, process until dough is in pea-sized pieces. Add lime juice and process until dough comes together in a ball. Divide dough among (6) 4 1/2-inch tart pans. Press dough into the sides and bottom until evenly distributed. Prick dough several times with a fork. Freeze for 15 minutes. Bake tart crusts at 425º until golden brown, about 10-15 minutes. 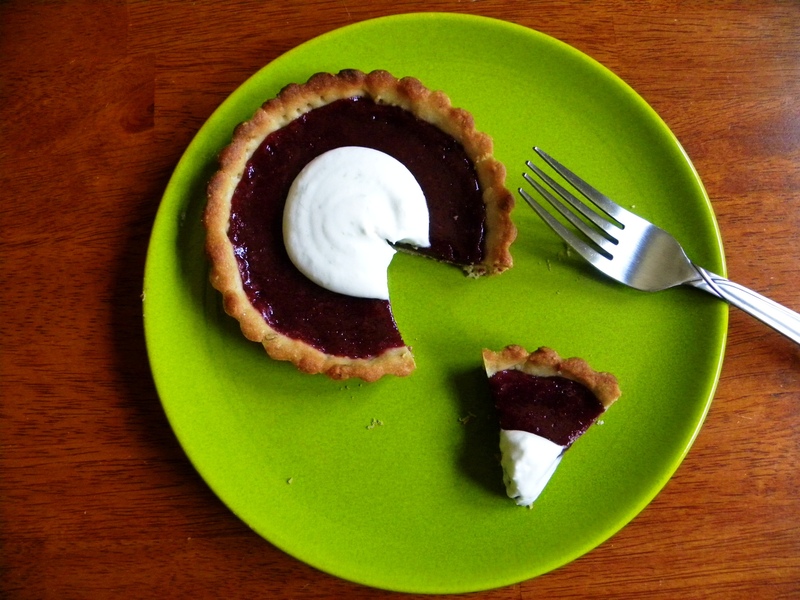 Fill crusts with ~1/3 cup blackberry curd. Reduce oven temperature to 350º and bake for an additional 10-15 minutes, just until the curd starts to set. Heat heavy cream in small saucepan just until steam starts to rise. Remove from heat, add lime zest, cover and let steep 30 minutes. Chill thoroughly. Whip until soft form. 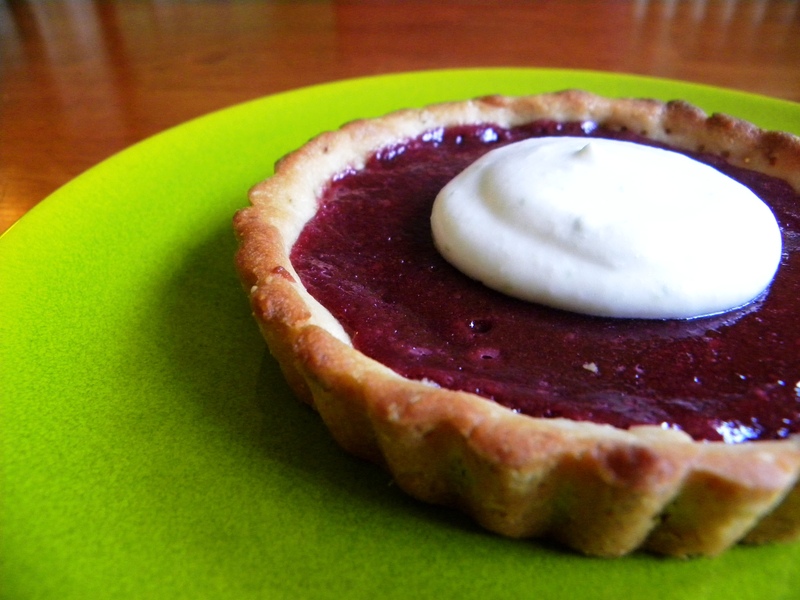 Top tartlettes with a dollop of whipped cream.